Surrey resident Steven Purewal has put together an exhibit commemorating the involvement of Punjabi soldiers in WWI. Pictured behind Purewal is King George V wearing a ceremonial turban. SURREY — Coming up on the hundredth anniversary of the First World War this Remembrance Day, images of poppies, Canadian maple leaves and saluting soldiers will adorn Surrey’s public places. Tales of valour, honour and duty will be remembered. But there’s another side of the story that hasn’t been told, until now. Duty, Honour & Izzat, a new exhibition put together by Surrey resident Steven Purewal, details the story of 500,000 Punjabi combatants who fought alongside Canadians in WWI. 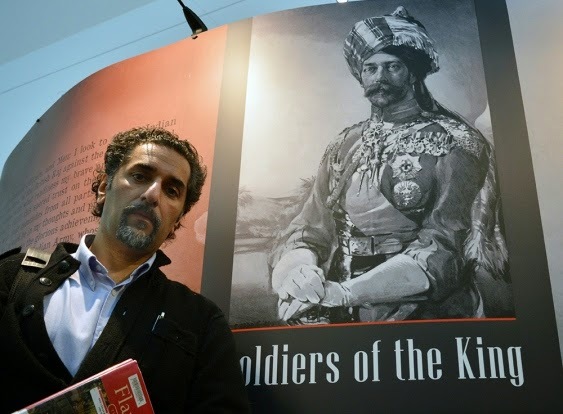 Purewal, a British-born Indian, has been collecting primary artifacts from WWI pertaining to the involvement of Punjabis, such as war medallions and propaganda art. 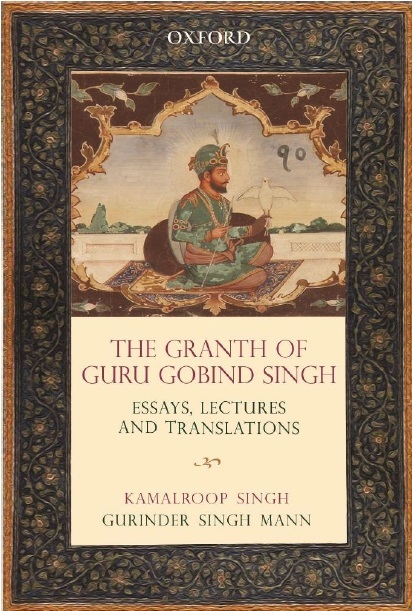 He said that the Sikh side of the story has been grossly underrepresented and even the public school system completely bypasses that aspect of its history. “The deficit isn’t just at the common layman’s level, it’s even in academia,” Purewal told the Now at the Central City Library, where the Duty, Honour & Izzat exhibition currently resides. “And even within professional historians, they have not picked up on this because they have no reason to. The only people who have a reason to tell this story are the people from that community, and we haven’t done it ourselves,” he said. Purewal is, of course, referring to the unrecognized Sikh soldiers who fought in the First World War that were omitted from the history books in several famous battles; namely, Flanders Fields, Vimy Ridge and both battles of Ypres. And that’s just to name a few. While he’s been sitting on this information for quite some time, collecting artifacts and sources, Purewal said it became more pertinent than ever to put together the exhibition now that the centenary of WWI – which happened from 1914 to 1918 – has approached. One of those injustices, Purewal points to, is an incident with Surrey’s Newton Legion that turned away Sikh veterans wearing turbans during a Nov. 11 ceremony. Another is the foreword in a popular children’s book widely used in local schools In Flanders Fields - The Story of the poem by John McCrae, which lauds the involvement of Canadian, Australian and New Zealand troops in WWI. There’s no mention of Indian troops, which outnumbered the Canadians and Australians combined. “If you read these things, you wouldn’t know that thousands of (Punjabis) had already fought in those grounds, (nor that) they were even there in the war,” he said. The omitted information from WWI is what also links many South Asians to the Fraser Valley. As part of Duty, Honour & Izzat, Purewal and SFU are teaming up to bring an ex-British military officer for a public lecture at SFU Surrey on Nov. 10. As well, 10 Surrey schoolteachers have signed up for a workshop with Purewal to add the untold bit of history to their curriculum. Duty, Honour & Izzat: The Call to Flanders Fields WW1 Centennial Exhibition, put together with the help of Surrey’s Simon Fraser University and some government funding, is on display at City Centre Library until Nov. 2, and will move to the Surrey Archives from Nov. 4 to 15.